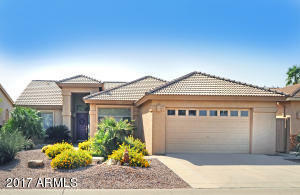 POPULAR Expanded Palmera floor plan with great room and split bedroom floor plan. GREAT location featuring a fully remodeled kitchen – sellers replaced kitchen cabinets in a beautiful ”rustic tuscany” wood with beautiful granite counters in the kitchen and laundry rooms. SS oven and microwave. This two bedroom, 2 bath home features a separate extended office with built in cherrywood desks and cabinets. Enjoy extra room in the extended guest and master bedrooms and the master features dual sinks, shower and a spacious walk in closet. Newer water heater and exterior was painted in 2013. Relax on the covered and extended patio with lush landscaping including fruit trees in full bloom! You will love the resort amenities and location convenient to all major freeways and airports! Must See!